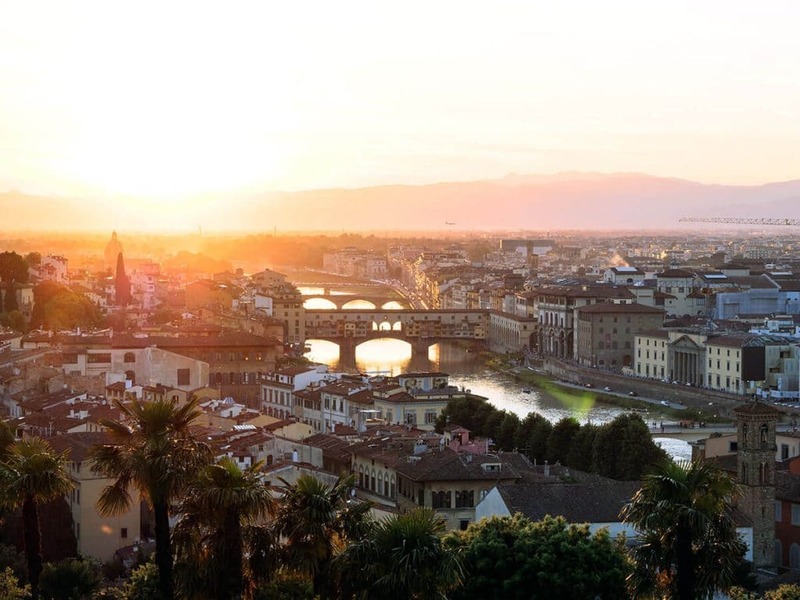 Florence is one of the most romantic Italian destinations. An extremely interesting city, rich in atmosphere, it’s considered by the whole world as one of the most romantic places ever. Let me tell you what in my opinion are the 22 things to see and eat in Florence. Those you can’t absolutely miss, that as an Italian I like to warmly suggest to everyone who asks me for information. I have skipped some of the most obvious destinations and experiences, like the Uffizi Gallery. 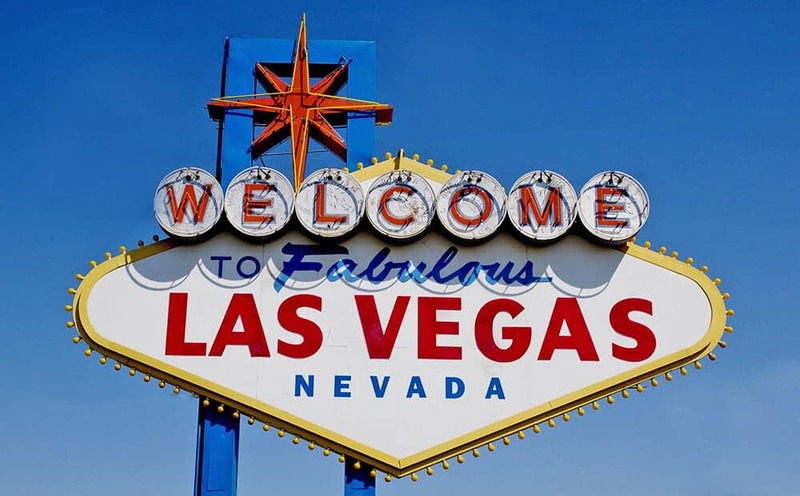 Wonderful, but … always so crowded (and expensive)! The crowds, alas. Allow me a little side note before we begin. In many of the photos you will notice (it’s impossible not to!) that there are so many people crowding the city. I’m often asked what is the best period to visit Florence to avoid the horrendous crowds. Well … I don’t think there is a better or worse period. Wherever you go, expect queues to enter museums, and crowded shots. The only tactic that has worked for now, as far as I’m concerned, is to start exploring very early in the morning! 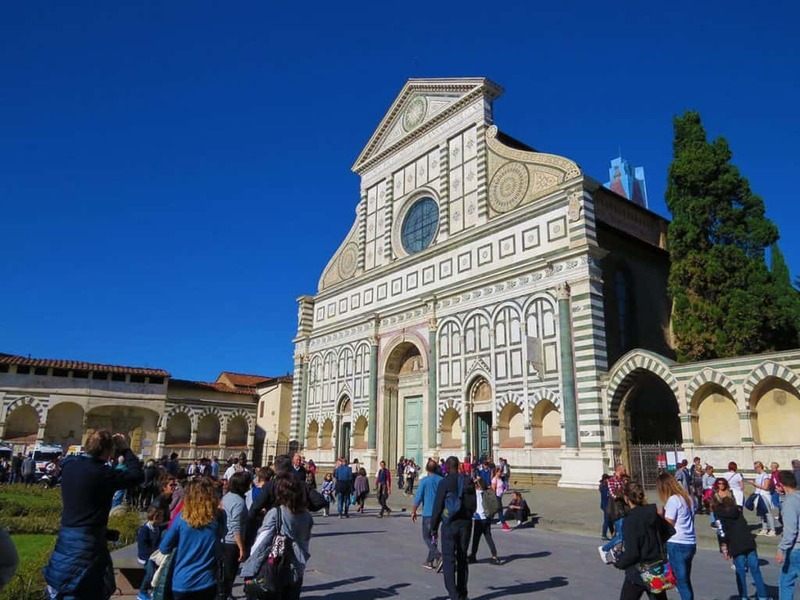 Santa Maria Novella is the nearest church to the railway station “Firenze – Santa Maria Novella”. If you get to Florence by train, you won’t have to walk long to get to this beautiful Church. It’s a very nice welcome to the city, if you ask me! Inside you will also find the Officina profumo farmaceutica di Santa Maria Novella, the oldest pharmacy in Europe, it’s been active for four centuries! It’s also one of the oldest stores in the world: to celebrate it, in 2012 the Italian government issued a special stamp with a picture of the inside of the pharmacy on it. You might find a lot of interesting Italian souvenirs at this pharmacy, but make sure you can bring them back with you by reading the TSA rules! 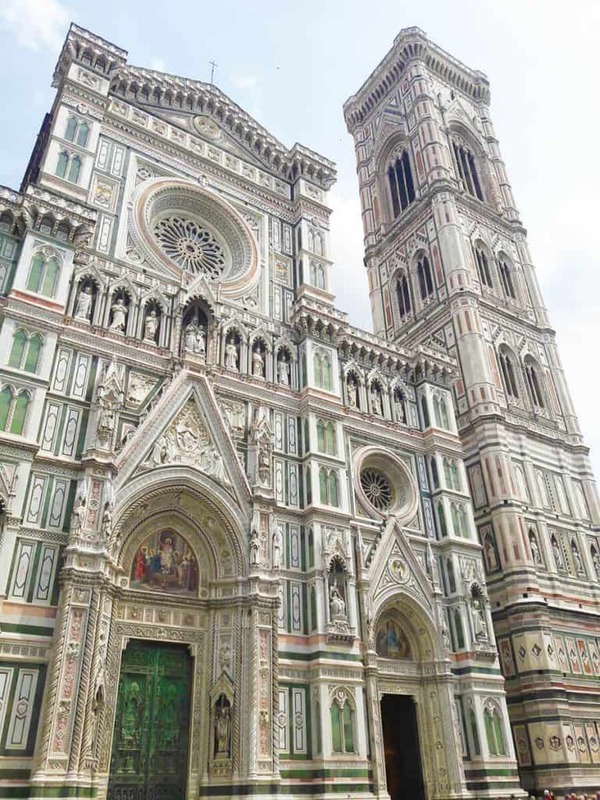 The Cathedral of Santa Maria del Fiore, commonly known as the Duomo, is the symbol of Florence, along with the wonderful Giotto’s Campanile (bell tower). It is the third largest Church in Europe after Saint Peter in Rome and Saint Paul in London. Surmounted by the largest masonry dome ever built, made by Brunelleschi, which today dominates Florence, it’s accessible by purchasing the Biglietto Unico. This ticket includes entrance to the Cathedral, the Dome, Giotto’s Campanile, the Baptistery, the Ancient Santa Reparata Basilica and the Opera Museum. The ticket is valid for 48 hours from the entrance to the first monument and costs €15. It is available online or at the vending machines and ticket offices in the square. Many of you will know it already, but because this is a religious site, you will need decent clothing to enter. You won’t be able to get inside if you are wearing shorts, sandals, or tops that leave your shoulders naked. Even sunglasses and hats are forbidden. If you want to sort this out, bring a cotton scarf with you in your backpack and put it on your shoulders right before to get inside. If you are brave enough, you can also climb the 414 steps leading to the top of Giotto’s Campanile. There are no elevators and this experience is not recommended to cardiopaths and to those who suffer from claustrophobia! 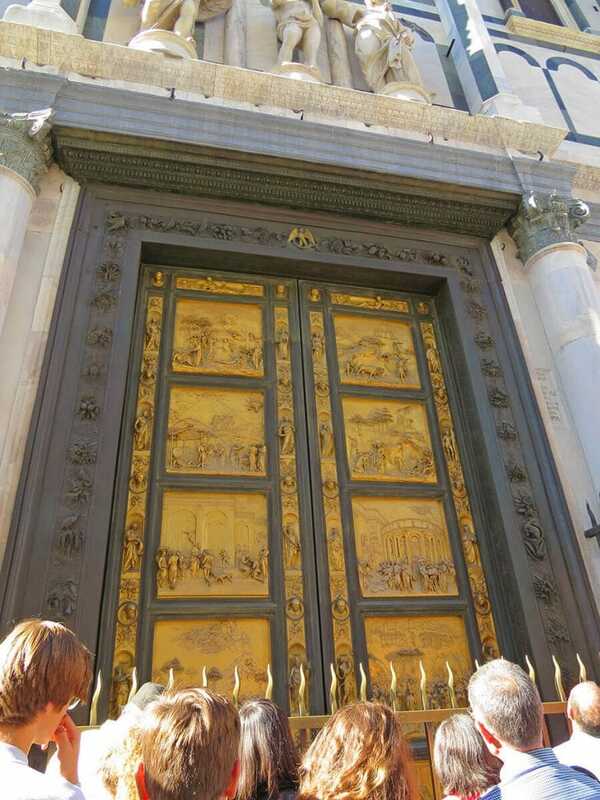 The Gate of Paradise is the east door of the Baptistery of Florence, located in front of the Duomo. The golden panels are not the original ones made by Lorenzo Ghilberti, (you will be able to see them at the Opera Museum) but a copy. You probably have noticed this gate in the movie “Inferno” from Dan Brown’s novel: the American actor Tom Hanks has repeatedly declared that he has been left speechless by the beauty of this gate. Unfortunately, as you can see from the picture, unless you get here very early in the morning, you will always find a huge crowd in front of this door: you either wait for it to thin down (it might take a while)… or you settle for a picture with a lots of heads! Piazzale Michelangelo in Florence is the most famous panoramic viewpoint in the city. At the center of the square there is a copy of Michelangelo’s David (here a few tips on how to skip the lines while touring Florence). My advice? 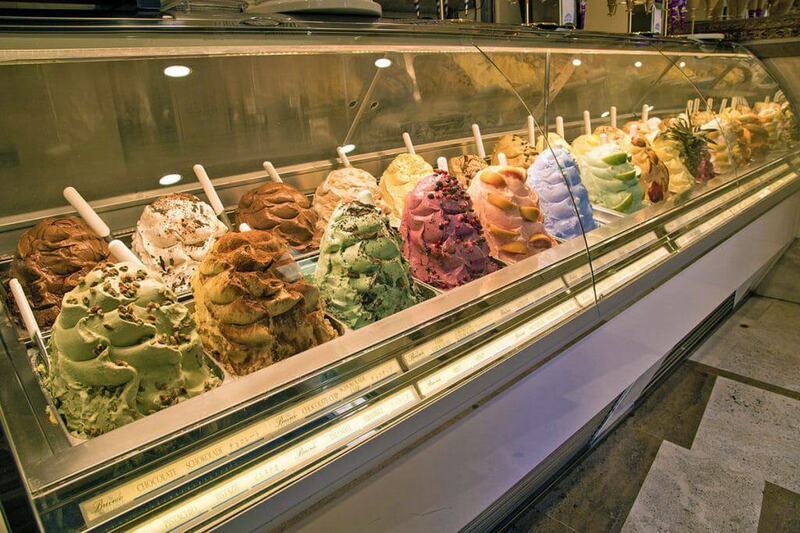 Enjoy a delicious Italian gelato (did this picture make you hungry yet? ), watching Florence from above, but not only. 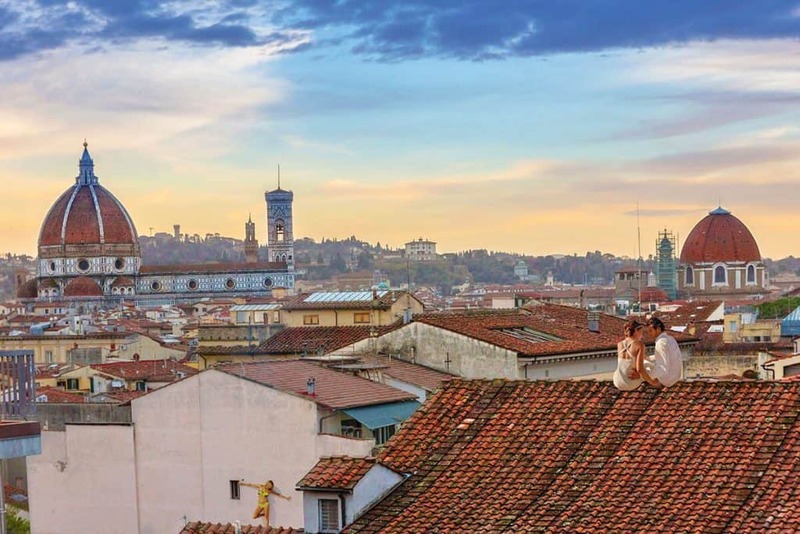 In Piazzale Michelangelo you will find many couples who come here from all over the world to get married or to take awesome photographs for their wedding album. Here I met an incredible bride. She came from Japan and wore a white traditional wedding dress with shocking pink inserts, a pair of Nikes and had a cool red Mohawk. Rock on girl! In case you get a gelato to go you won’t need to apply the Italy tipping etiquette! Yes, the Arno river is yellow and when the water level goes down it becomes green. When I published one of my Ponte Vecchio shots on Instagram, so many of my followers couldn’t believe to this “weird” natural phenomenon! Visiting Florence without spending some time taking pictures at Ponte Vecchio would be a madness. Wonderful at any time of the day, it’s an icon of this city. 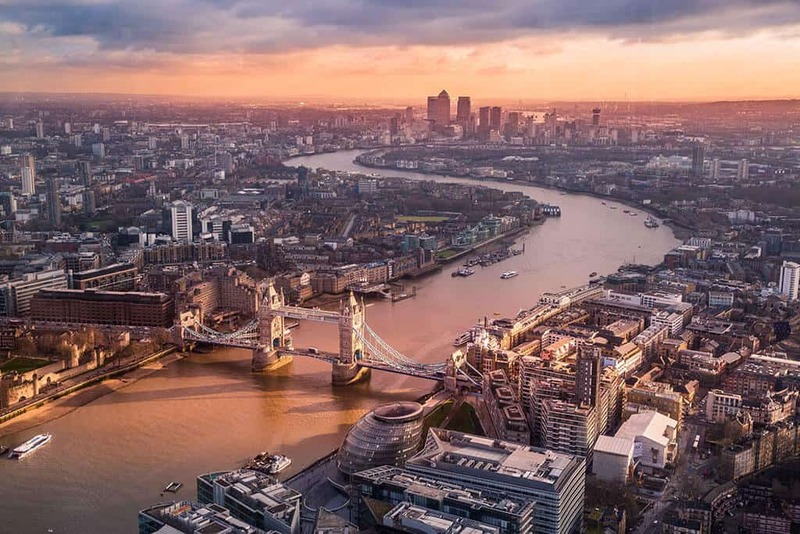 However, I also recommend taking some time to walk on the bridge, admiring the fine goldsmith shops and mixing with the cheerful crowd … maybe you will also feel a bit like Robert Langdon in “Inferno”. 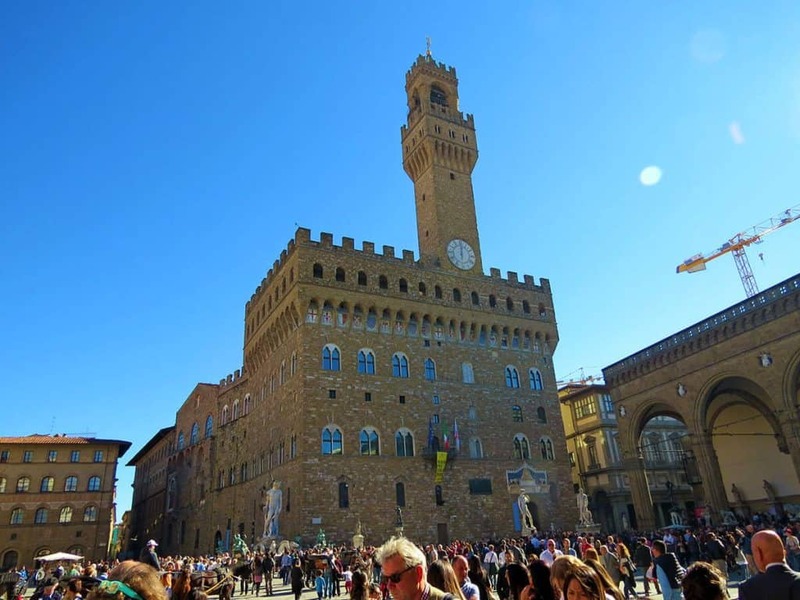 Piazza della Signoria is an L shaped square, located in front of Palazzo Vecchio. It’s one of the most beautiful squares in Florence and has this particular form because of the war between Guelphs and Ghibellines. After the victory of the Guelphs, in fact, 36 houses belonging to members of the enemy faction were demolished. Everyone was forbidden to build new houses on these grounds and therefore the rest of the city continued to grow all around. This large square has always been the center of the city’s political life, as well as a meeting place, characterized by many small bars and shops all around. What’s better than having a good espresso coffee with a view on the many monuments in Piazza della Signoria? Reaching Palazzo Vecchio, especially if you come from the narrow alleyways around the building, can be a quite difficult task. It’s not just a matter of sidestepping the horse-drawn carriages, but having to try and push your way through a sea of people. I still remember with horror the time when, as we walked towards the market, our friend began to feel sick in the crowd. There were too many people, and they were pushing too much. She got very scared and risked a panic attack. That’s why I often suggest visiting Florence on weekdays: the weekend can be terrifying. Palazzo Vecchio is the town hall of Florence, characterized by the reproduction of the David by Michelangelo and the clock tower. It was originally the “Palace of the Signoria“, and later became “Vecchio” (old), when the Medici’s Duke moved from here to Palazzo Pitti. The entrance to the Palazzo Vecchio courtyard is free. 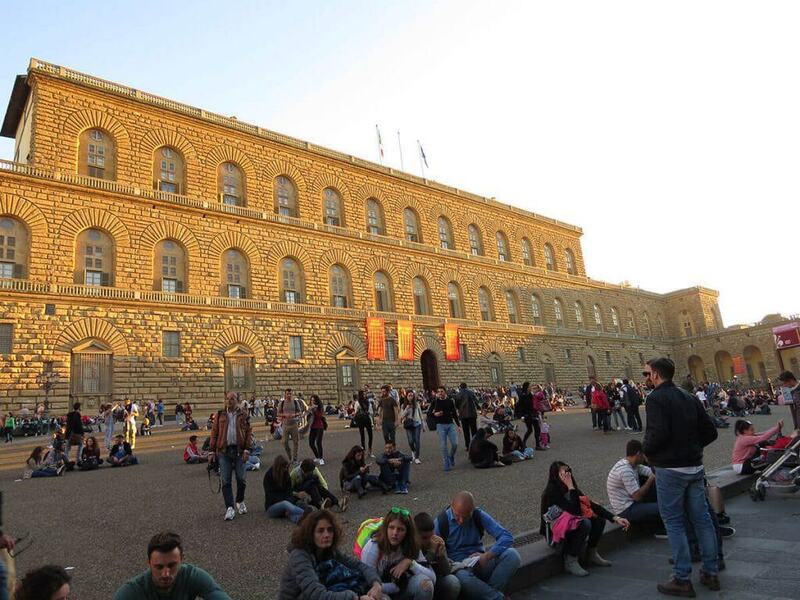 You can access from the main gate on Piazza della Signoria. 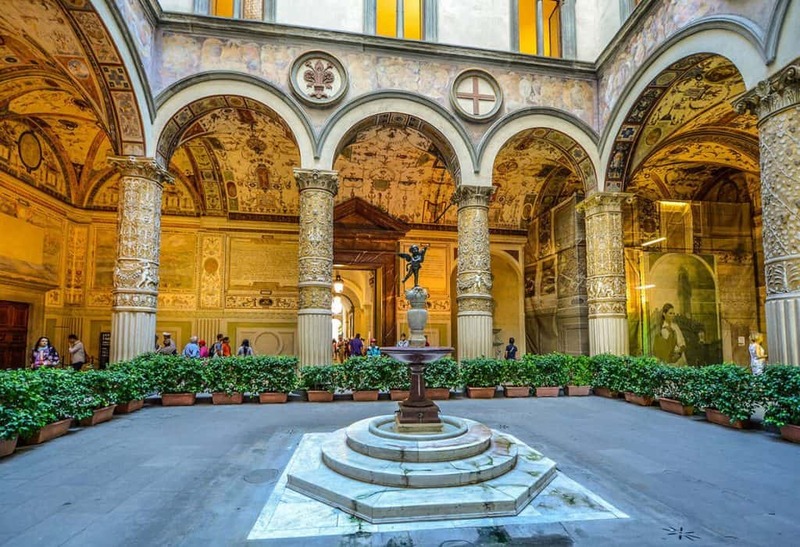 This wonderful area was designed in 1453 by Michelozzo and later embellished by Giorgio Vasari. You will be able to admire finely decorated stuccoes and columns, but also the crests of the city’s arts and crafts corporations. In the center, replacing a well, you can see a wonderful porphyry fountain: the water comes directly from the Boboli hill thanks to an ancient water pipes system. From the first courtyard you can access a Chamber of Arms, now used for exhibitions and events, and a second courtyard, used in the past as a space for Customs. Here you will find the ticket office for the Palazzo Vecchio museum. As soon as you leave Palazzo Vecchio, don’t forget to look at the wall on the right of the entrance. 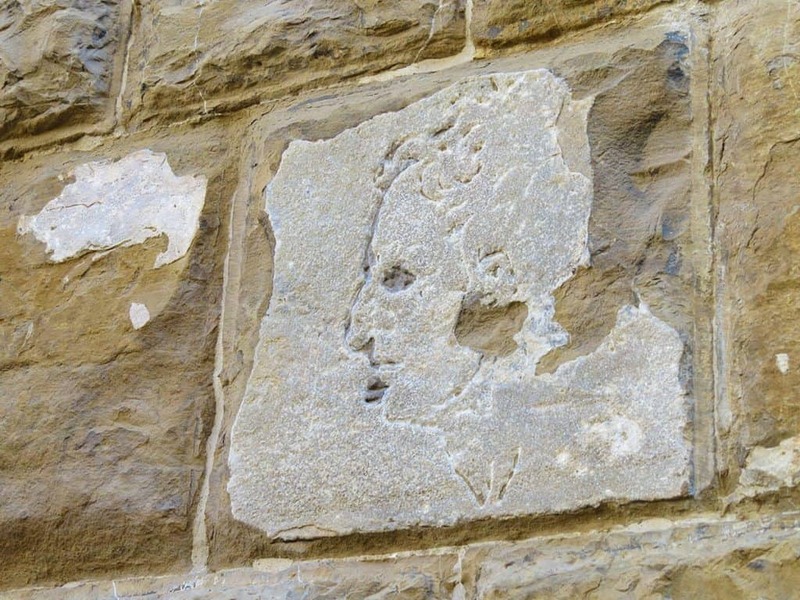 Almost camouflaged among the bricks you will find a man’s head profile carved in the stone. It is one of the oldest mysteries in Florence, and more often than not the tourists don’t even know it! The legend says that Michelangelo Buonarroti was always stopped by a person who bored him so much. He was always telling the same story of his financial failures, a justification of the reason why why he hadn’t returned to Michelangelo the money he was given. It was on one of those occasions that the great artist, who had his tools with him, carved the profile of the boring man in the stone, with his hands behind his back, as he was still pretending to listen to the same story…over and over again. It could only be a legend, but the figure really exists and the Florentines have for centuries affectionately named it “L’importuno” (the irritating man). Since the most part of the tourists head to the city center or Ponte Vecchio, you can enjoy a stroll along the Arno in peace. In the summer of this year, the city opened a new a walk along the river from Piazza Poggi, especially for the kids. In fact, along the shore they placed five sculptures that represent fantastic and real animals, made with wood found along the banks of the Arno river. Part of the walk is free, while in the evenings there is an aperitif for the whole family (you will have to book a ticket for that). 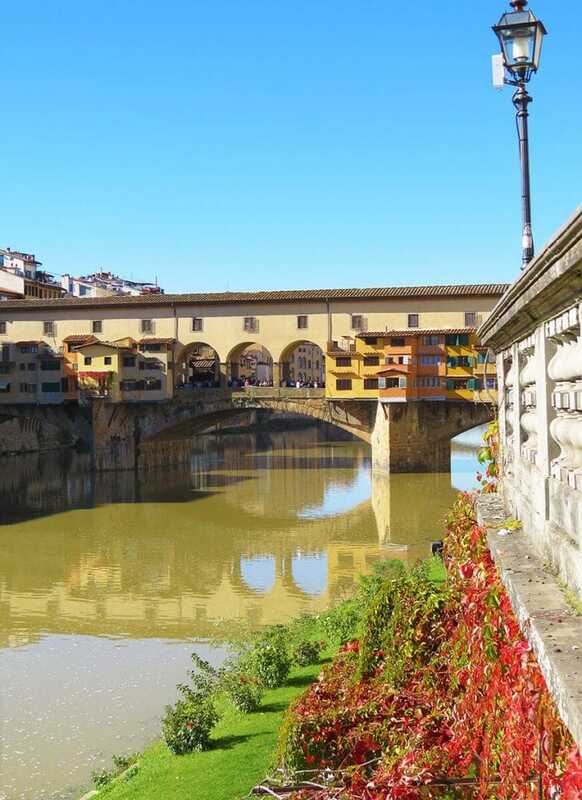 From the banks of the Arno you will also have the chance to take beautiful photos of Ponte Vecchio! 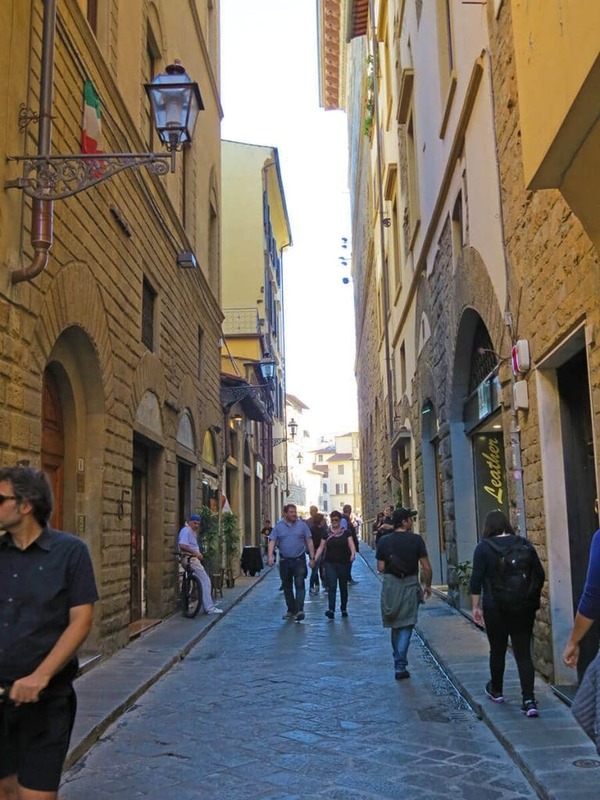 The narrow alleyways in Florence have so much to say that they’d deserve a separate article. Wonderful, especially when framing a slice of majestic historic buildings, they are also one of the best places to go hunting for restaurants. There are great chances to find small restaurants and street food kiosks at lower prices than those in the most central areas. Along the alleyways there are also many craft shops, which mainly sell leather goods. 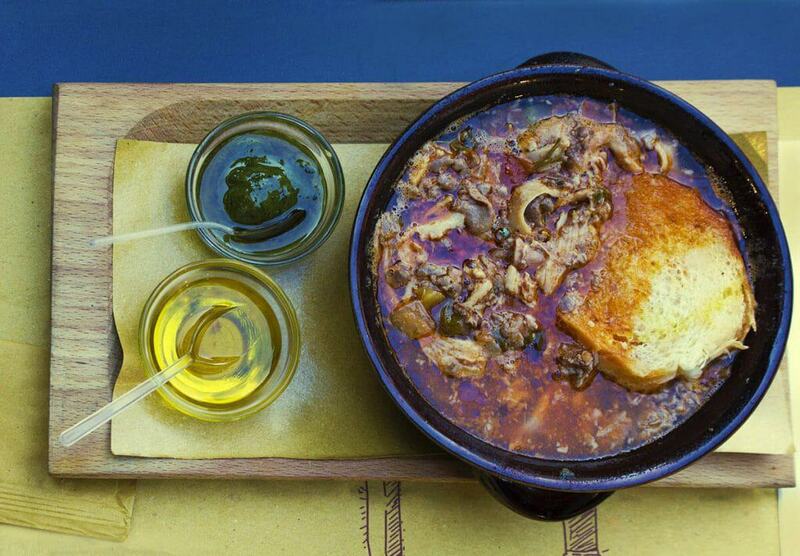 The Lampredotto is a typical Florentine dish, based on one of the four bovine stomachs, the abomasum. It’s a poor dish, still very widespread in the city, thanks to the presence of numerous kiosks of so-called “lampredottai”, located in different areas of Florence. The stomach of the bovine is cooked for a long time in water with tomato, onion, parsley and celery. You can eat it as a regular stew, seasoned with green sauce, or cut into pieces and served in a salted Tuscan sandwich. The top is usually soaked in the lampredotto cooking broth. If you are brave enough to try it… go for it! 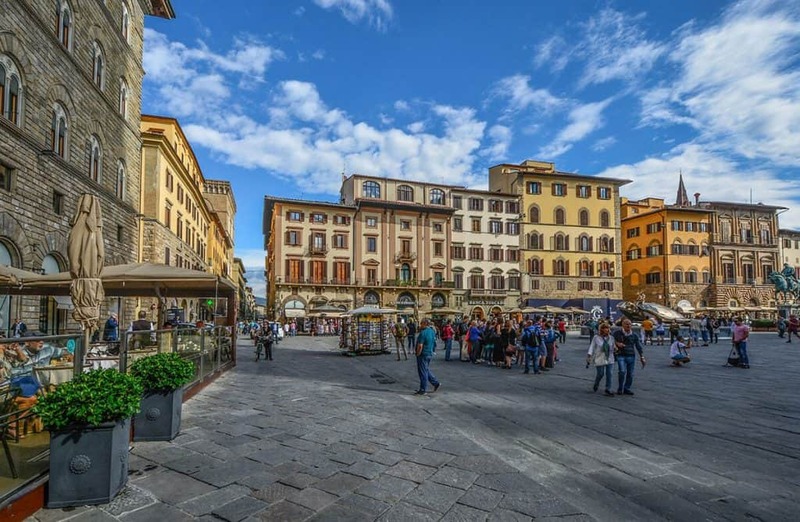 Piazza della Repubblica is located in the historic center of the city, and could be defined as the “navel” of Florence, as it’s right in the middle. This is a meeting place for Florentines, always full of street artists and musicians. Here you can listen to music from all over the world, dance with with break dancers or observe brushes and pencils that move slowly on the canvas, reproducing the marvelous architecture surrounding these urban artists. 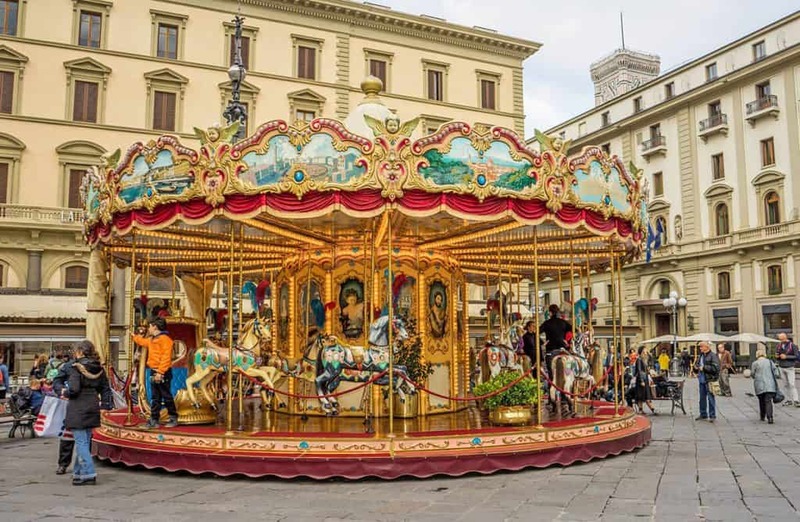 At Piazza della Repubblica you can’t miss a beautiful carousel with twenty horses and two golden carriages. The lovely wooden structure is painted with cheerful pastel colors. This is the old carousel owned by the Picci family, lovingly restored, and it operates from November to May, more or less from ten o’clock in the morning, to eight o’clock in the evening. It’s a real injection of youth, and definitely an experience out of the ordinary that will make your trip in Florence unique! Just beyond the Mercato Nuovo (new market), you will almost certainly find a bunch of crowded people in front of a fountain depicting a wild boar called “Porcellino” by the Florentines. It is said that touching the nose of this “piglet” brings you luck: in fact that is the most shiny and consumed part of the fountain! According to the ritual you also have to place a coin in the open mouth of the wild boar, wishing hard for something. When the coin slips down, if it falls into the grate, your wish will come true. Otherwise… all there’s left is to try again! Coins collected here are donated to charity, another great reason to try your luck! San Miniato al Monte is one of the highest places in Florence. 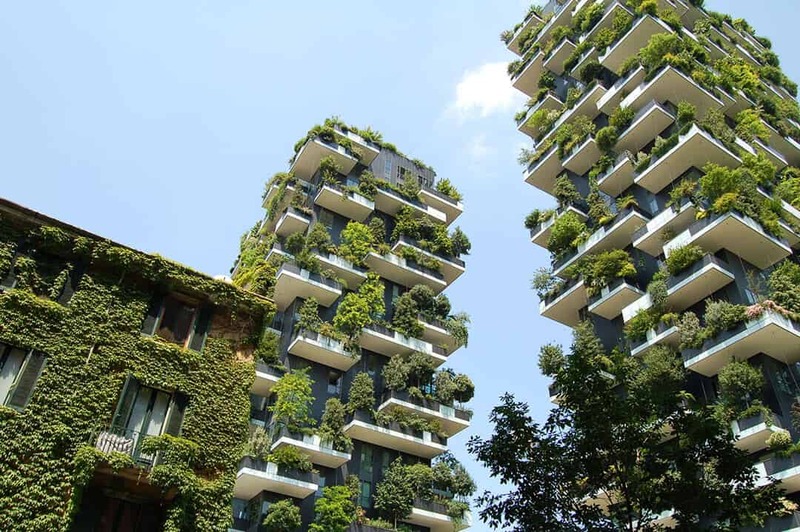 From here you can take wonderful photographs of the city and the Arno river. It’s also possible to visit the Basilica of San Miniato al Monte, a masterpiece of Florentine Romanesque architecture. Here you will see one of the oldest sundials still working in Europe. The floor depicts a marble zodiac dating back to 1207. Only 2011 it was discovered that for a few moments, at noon during the summer solstice, the Cancer sign is illuminated by a sunbeam. 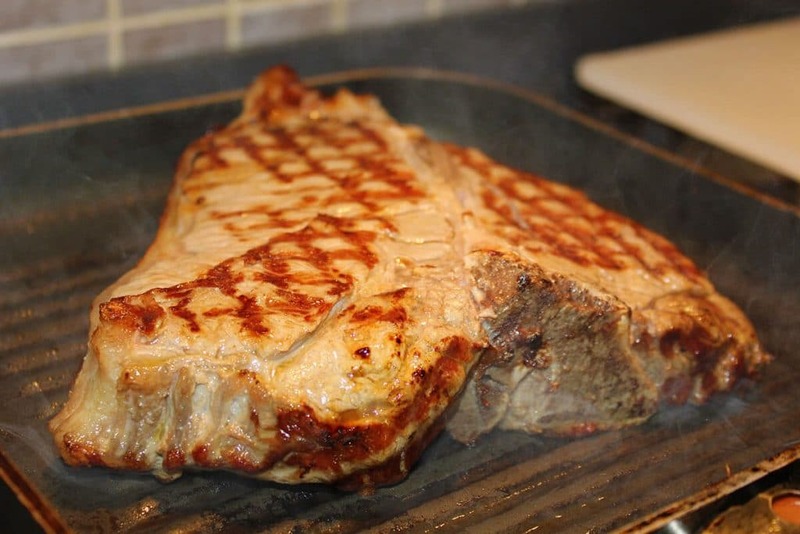 The Fiorentina steak is the pride of Tuscany. It is a T-bone (it has a T-shaped bone in the center) of Chianina meat, a local breed known for the delicious flavor of its meat. The particular flavor of the Fiorentina steak is due to careful maturation that lasts at least two weeks in special refrigeration cells. It has to be 5-6 cm high and is cooked rare (don’t even try to ask for it to be well done!). It is traditionally served with cannellini beans with olive oil or salad. You should opt to get it with a good glass of classic Chianti wine. Yes, yes, it’s expensive. But we never ate a better steak! They try to copy this recipe also in other Italian regions, but no one can prepare Fiorentina as they do in Tuscany, so make sure you don’t miss your chance! 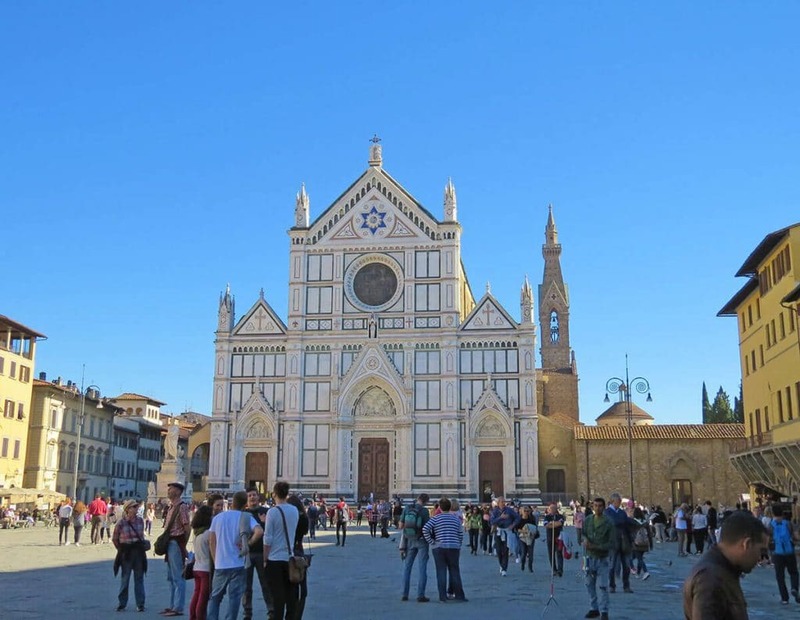 The Basilica of Santa Croce is the main Franciscan Church in Florence. It is the burial site of some of the most illustrious Italians such as Michelangelo, Galileo, Machiavelli, the poet Foscolo, the philosopher Gentile or the composer Rossini. That’s why it is called the “Temple of the Italian Glories“. Every year here is the Partita dell’Assedio (a soccer match). Something in between between history and sport. It is a historic re-enactment of the famous game played in 1530 while the Florentine Republic was under siege by the imperial troops of Charles V… and had been for more than a year. The players are divided into two teams, but the match often ends in brawls: luckily enough there have never been serious consequences! This historic park was born as a garden of Palazzo Pitti and is connected to the Forte di Belvedere, a military forstress that guaranteed the safety of the sovereign and his family. 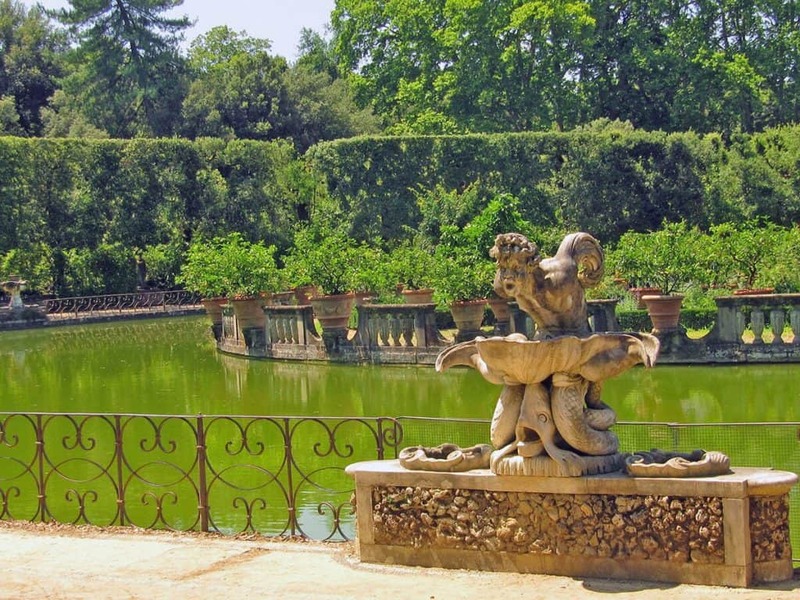 It is one of the most important examples of Italian garden in the world, as well as an open-air museum that welcomes around 800,000 visitors every year. The ticket price, including the entrance to the Silver Museum, the Porcelain Museum and the Bardini Garden, is € 10. If you are going to buy pre-sales tickets online so you can skip the line, you will need to add 3 € for a total of 13 €. Palazzo Pitti alone would deserve at least a half-day visit to see the Royal Apartments, the Boboli Gardens with the attached museums and the Palatine Gallery. However, for a quick visit, which will leave you breathless anyway, you could only visit Palatine Gallery and Real Apartments. Located in the left wing of the palace, the gallery hosts masterpieces by Raphael, Tiziano, Caravaggio, Rubens, Pietro da Cortona and many other Italian and European masters of the Renaissance and the 17th century. The setting is gorgeous, with golden frames and frescoed fashions: if you love art, you can not miss the Palatine Gallery. For me it was a great emotion to see so many paintings of artists who made the history of art, into such an opulent setting. Tickets for Palatina Gallery cost 8,50 € but be careful: they can undergo variations in case of special events or temporary exhibitions. It is always best to ask before you buy your ticket! 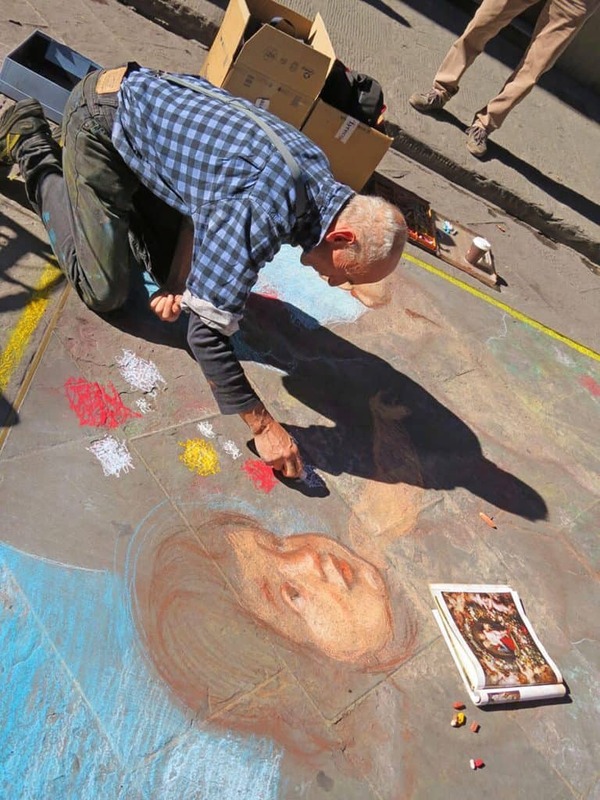 Street artists who recreate great masterpieces (often religious scenes) on the sidewalks of the great metropolis are called “Madonnari” in Italy. In Florence we found some very good ones: it was very warm, yet despite them not being exactly young, they were kneeling on the floor to draw with their colored chalks, without worrying at all about the sun, the crowd of curious people, the passing of hours. This is kind of art is slowly dying: in Naples for example we have never seen Madonnari! 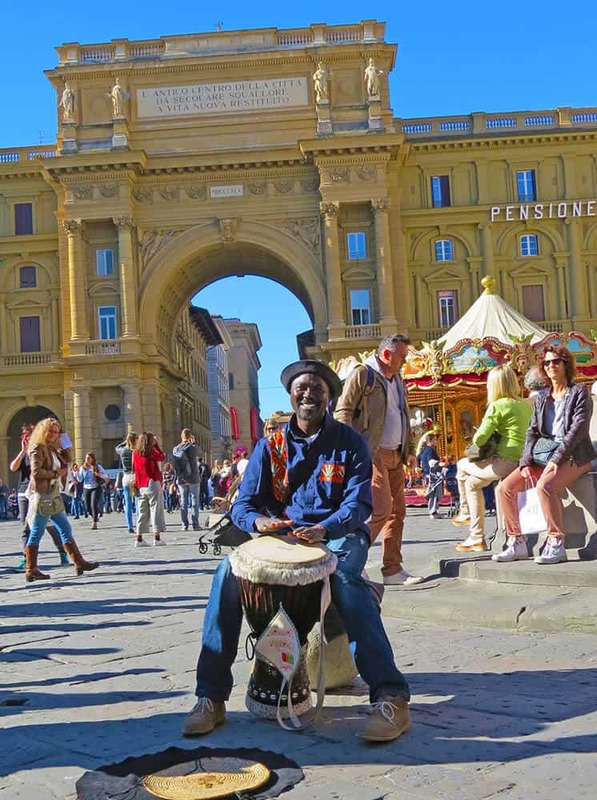 Take advantage of these artists in the wonderful setting of Florence. Observe them as they work, look at the dedication they put into each of their masterpieces. And if you can, when they’re done, give them an offer and a kind word: they are very happy to know that there are people who appreciate their art! The Aperitivo is an alcoholic or non-alcoholic beverage that is consumed before meals to stimulate appetite and in Italy we just love to go out for an Aperitivo with our friends. It is usually accompanied by appetizers and finger food. 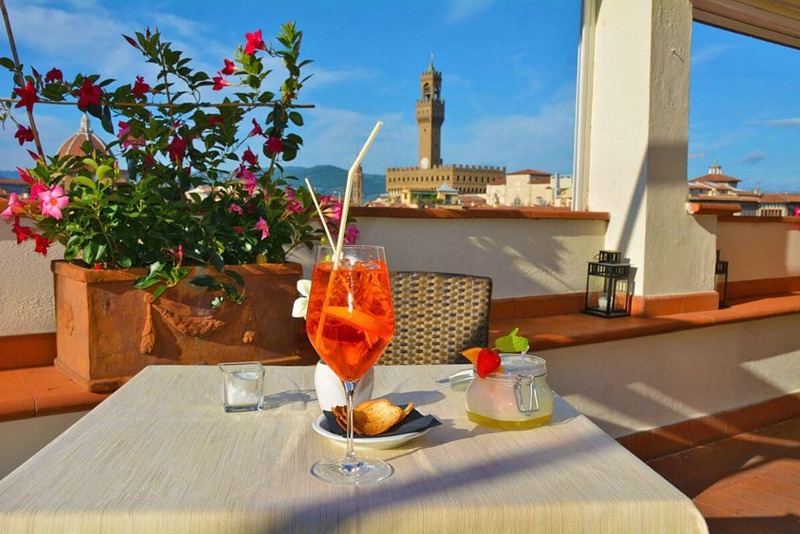 The Negroni and the Spritz are the favorite Aperitivo in Tuscany. The best thing to do in Florence is to have it on a rooftop bar, on terraces with a view that will also allow you to take beautiful photos of the city. The dress code in this case is very rigid: no jeans or shorts. Dress appropriately for the swanky rooftop bars. One of the most popular rooftop bars right now in Florence is B-Green on the Hotel Baglioni terrace: with 15 € you can have drinks, finger food gourmet and live music from Monday to Friday. If instead of Negroni you want to try Tuscan wines and craft beers, opt for Minerva Giò, on the roof of Hotel Minerva, in Piazza Santa Maria Novella. … in short, we’ll have to sacrifice ourselves for the sake of a nice picture… right? Still don’t know if you want to visit? Here you find a comparison between Rome and Florence to help you decide! 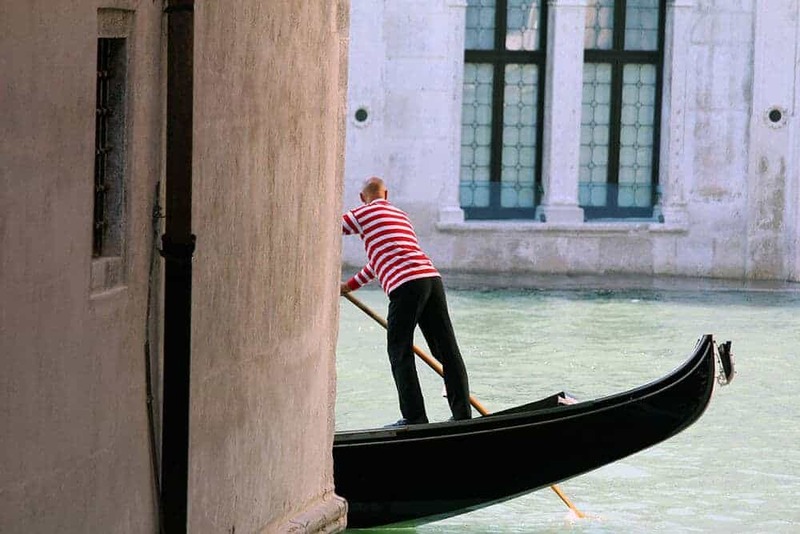 In case you’re visiting in the warmer months, check out our guide to learn what to wear in Italy in summer and how to avoid the most common travel mistakes! I have no idea about the L’Importuno, I was in Italy a few years ago and Florence was one of my favorites places. I love to read more about that beautiful city! It’s one of those places that the locals know but it’s not very advertized in travel guides! 🙂 Are you planning to go back for more? A fabulous list! I was actually really surprised that I enjoyed Florence, mainly because at the time I visited I was 18 and didn’t think that I liked museums (we visited as part of a school art trip from the UK). But I was blown away! I have fond memories of Cathedral of Santa Maria del Fiore, and eating gelato in the many squares. And just the whole atmosphere – watching street artists at work, slowly walking along the canals. Fabulous tip on the San Miniato al Monte for photos over the rooftops, and on the Boboli gardens, I really enjoyed my time there! How cool that you got to see Florence with the school! I think that with the years it has become more and more crowded, which is something I’m not particularly fond of. Avoiding the festivities and the weekend, or going out early in the morning are the only tricks I have to avoid the huge mass of tourists! Does Arno River go yellow to green due to some algae activity? I am keen to know why? Walking along the river Arno looks lovely – it is one of my favorite activities to do. Yes it’s because of algae and as far as I know it’s a natural phenomenon! Hi, I visited Florence last year in September and found it to be perfect. My daughter and her partner are planning a trip to Italy in December. Do all the main attractions remain open in winter and also where else do you recommend they visit in Italy at that time of year? Hi Linda! I’m so glad you liked Florence, and I hope it wasn’t too crowded when you’ve been there? The main attractions are open in Winter, there might be slight variations on the times, but you can easily check from their official websites, in case! As for another destination, think about Napoli! I’m biased, I know, but my city is absolutely awesome in Winter! At December they could also visit our Christmas Alley, which is a narrow street in Naples where all the artisans build their “Presepi” (nativity scenes) and where shops sell everything you need for a Neapolitan Christmas. The city is very beautiful with all the Christmas lights, that we usually lit after the 8th of December. I’ve often written about Naples on the blog, you can check a one day itinerary here, or a practical guide on what to eat and where, to make sure you avoid the tourist traps, eating where the locals eat. There will be more soon, I’ve been slowing down only because I’m packing for another trip! Experienced almost all of these while in Florence 🙂 And went further by wandering into quiet streets and peeking into little corners away from the buzz of the busy city. Florence is so rich in atmosphere that you can never get enough of it. I want to eat my way through Florence! Thanks for all your yummy suggestions. I LOVE Florence. I met with some friends there and were able to see and do much of this. My favorite, other than the carousel, was definitely the Fiorentina steak. It was amazing- and I agree you need Chianti to wash it down with! I’m not sure I would like it, but I’m certainly willing to give Lampredotto a try! I love a good local street food, eating what the real people eat. I can’t wait to go to Florence now. Ah Italy and Florence, I’m yet to see you! This is a great list and love the pics. Can’t wait to visit. My favorite parts will probably be walking along the Arno river and eating lampredotto. You’d be brave to try it! Not many people like to do it! Yet honestly I don’t find it that bad! Great detailed post! We loved the gelato at Vivoli. Only had one day in Florence yet managed to hit a lot of these spots. Thanks for the delicious reminders! Oh yes best gelato ever! 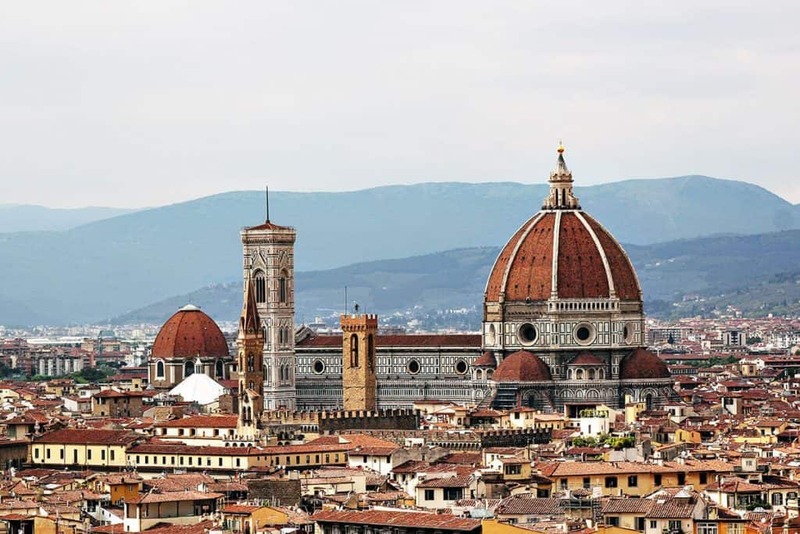 Great list , Florence is high on my bucketlist. Just visited Rome and Venice, should’ve definitely swapped them out with Florence. Arno river looks so pretty too. I visited Florence several years ago, and it was not my favorite Italian city. It was a little too artsy for me. I prefer the smaller towns in Italy to the bigger tourist ones. I’ve only ever been to Rome in Italy (twice…), but I would love to go to Florence! Do you think it would be suitable for solo travel too? Since I don’t have a fixed travel partner to be romantic with, haha! Also, your food photos made me hungry! The views look so heavenly:) Thanks for sharing, the post is so detailed with so many suggestions! Very nice photos and tips. I will follow your hints when I am going there soon!Thanks! Wonderful! When are you coming to Italy? Looks like you had a wonderful visit to Florence! I don’t quite know how I’ve still not been there, but your photos really remind me I need to take care of that as soon as possible. Beautiful city. Fingers crossed that you get there soon! I spent two days in Florence in 2013 and did some of these things but not all, unfortunately. The history and ambience there is amazing. But now you have the perfect excuse to get back for more! Just beautiful! Great to know that there are plenty of cheap and even free stuff to do in Florence. And oh, can’t wait to taste authentic italian pizza and gelato! Florence is just a great place to visit and ambling around seemed to be really fun. I love the fact that they really have so many things to offer. I would love to try their luscious food as well If I get the chance to visit here. Thank you so much for sharing this with us. Oh yes it’s one of those cities that I think you should experience in (at least) 2-3 days, at the very minimum! Are you trying to make me blush? 🙂 Fingers crossed that you can visit soon! 22 things to eat in Florence.. I don’t think that list is big enough for me. The gelato looks amazing and is definitely first in line to be devoured when we visit Florence. Don’t miss the fiorentina steak too, it’s their signature dish! Wow, Florence is so stunning , every picture you took do justice to the beauty of place. 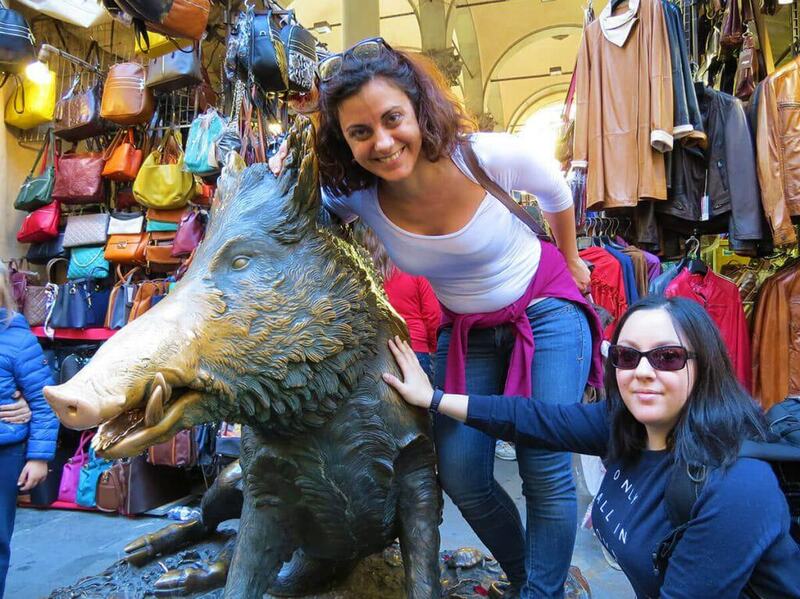 I am already been invited by my last couch surfing guest to visit Florence, as she is from there. I guess after reading your post I have to definitely pack my bags and plan. Oooh then you might go soon! If you do, let me know how you liked Florence! I have been dying to head over to Florence and this definitely further inspires me. I can’t wait any longer ? So beautiful ?I love the way you featured the architecture and the food! I will keep your finvers crossed that you can go over there soon! You have some really beautiful pictures there. I would love to check out the Porta del Paradiso besides trying the food at every famous restaurant and cafe. 🙂 Cheers!! What did you eat over there? Wow Florence is fantastic, my friend told me since before to go there but I havent had a time yet for schedules I really wanna visit it. lovely photos and great post! Oooh fingers crossed that you make it there soon! Been to Luca when I was a kid and some other places I can’t remember i visited in Italy, but never been to Florence. Definitely on the books though..
Wow thank you very much, I’m glad you enjoyed this! I tried how to (slightly) avoid them but Tuscany is so beautiful that you just can’t live without having a taste now and then! Lucca is much more quiet and Palazzuolo sul Senio is even better, up in the north of Tuscany, in the mountains, another place where I’ll gladly go back to! We do go to Florence and Lucca at least once every year, it’s one of those addictive places! Haha LOL but you have to visit Napoli to have the best pizza in Italy! 😀 Even if I concede that gelato while watching Florence from above is something else entirely!! !